« M82, M33 – AltAz Imaging at f/10! I generally welcome a sunny day — if it’s going to lead to a clear night. However, clear nights this part of the lunar cycle are not quite as exciting. No, a full disc moon is not really something that makes for great ‘dark skies’. However, it does allow one to hit double stars, globular clusters, and of course, the ever exciting planetary nebula. 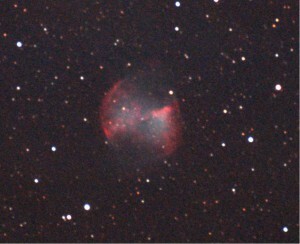 Last night’s target was M27, the Dumbbell Nebula. Lumicon’s UHC filter probably would have been best, but I still ended up using the Orion Skyglow. The Skyglow is kind of like a bad UHC filter — it passes a lot of light through outside the OIII and H-beta lines. Nonetheless, it’s still a pleasant effect. Last night was mega problems as far as guiding. I did a rough alignment to start with Mizar and Arcturus and added my favorite two calibration stars, Vega and Altair (love the summer triangle stars!) However, it was apparent from my goto’s that the calibration was way off. Usually I would use a collimated finder or illuminated crosshair reticle (Orions 20mm is nice! ), except I didnt want to take the camera off and muddle with focus just for alignment. So I took pictures and centered them based on the image I took. This process was almost certainly slower than just refocusing later, so I’ll probably do it ‘the normal way’ next time. Because I had some recent successes autoguiding with PHD Guiding, I tried to give that a whirl many times over and continually had problems. The two weird behaviors I couldn’t explain were the “frame rate” accelerating much faster than the 1s exposures I had it configured for and what appeared to be a “freeze frame” while trying the calibration steps. Unfortunately this always would result in the failure of calibration — and therefore no autoguiding. By this time I was so frustrated I ended up realigning all over again, and dropping in a 2x barlow for some extra fun. Rules for next time: spend more time properly aligning and calibrating the scope! 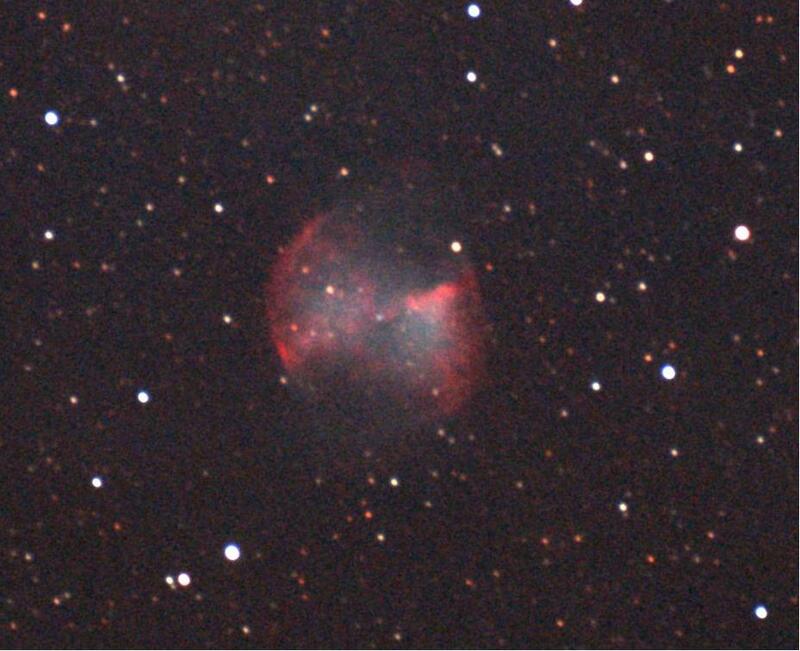 It seems many people coming to this page are looking for information about locating the Dumbbell Nebula. It’s not particularly hard if you have a clear view to the summer triangle. It’s about 2/3 down from Deneb in Cygnus towards Altair in Aquila. The somewhat difficult to see Sagitta constellation is a pretty good reference since it is pretty close by. The brightest star, Gamma Sagitta will be just below M27 in the line connecting Deneb and Cygnus. M27 is pretty bright and fairly large (15 arc mins), so scanning will make it easy to find even with lower power, wider fields. 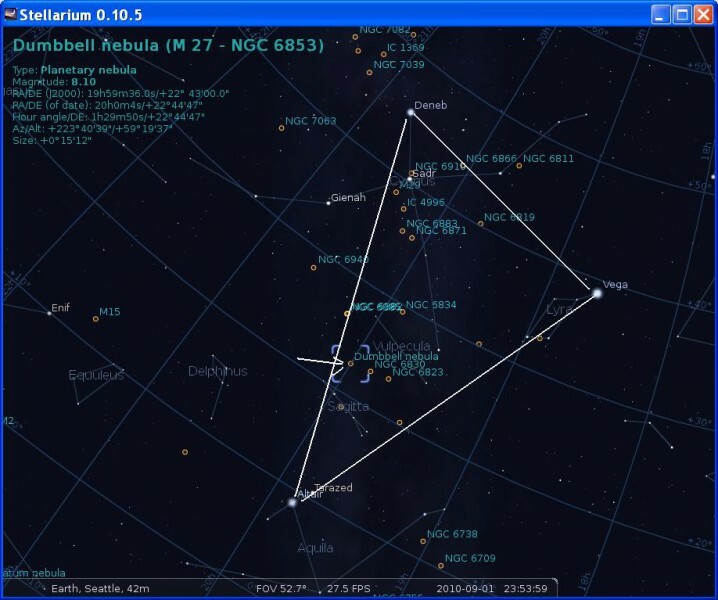 Below is an image from Stellarium to help you find it! Happy hunting! This entry was posted by admin on July 26, 2010 at 8:42 pm, and is filed under Nebulas. Follow any responses to this post through RSS 2.0.You can skip to the end and leave a response. Pinging is currently not allowed.